1963 built for Sameiet Seagull A/S of Oslo as the SEAGULL. 1964 sold to Dr Erich Retzlaff, Bremen, Germany. Renamed FERDINAND RETZLAFF. 1970 sold to Angbats A/B Kalmarsund, Sweden and renamed KALMARLAND. 1973 sold to Northern Steam Ship Company. 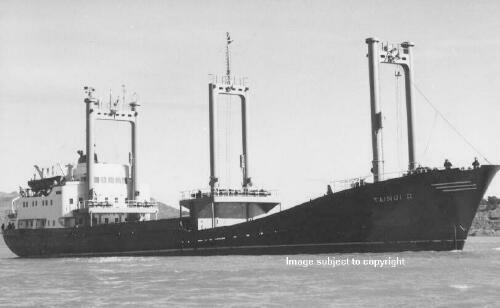 Renamed TAINUI II. 1974 November laid up Auckland. 1976 sold to Ayo Shipping Company of Florida and renamed KORAL. She sailed from Auckland 24th May 1976 for a new career in the Caribbean - the last vessel in the Northern Steam Ship Company. 1979 Nov 5th sank after strking mooring dolphins in the Gulf of Mexico. She was on a voyage from Dominican Republic to New Orleans with sugar.